Springfield, Oregon dentist Dr. Schilt and his team at McKenzie River Dental provide individualized periodontal care and treatment with a gentle touch. Periodontal disease and decay are both caused by bacterial plaque, the yellowish film that sticks to your teeth along your gum line. Bacteria found in plaque irritate your gums, which may cause them to turn red, swell and bleed easily. Prolonged irritation causes the gums to separate from the teeth, leading to the formation of spaces between the teeth and gums. If allowed to continue to colonize, the increased number of bacterial plaque develops into calculus and eventually leads to tooth loss. Periodontal disease is best prevented by thorough daily brushing and flossing of your teeth, along with regular routine visits to see your hygienist at McKenzie River Dental. Scaling and root planing is a common treatment for periodontal disease. This method allows Dr. Schilt and a registered dental hygienist at McKenzie River Dental to provide a deeper cleaning between the compromised teeth and gums, preventing progression of the disease as well as tooth loss. 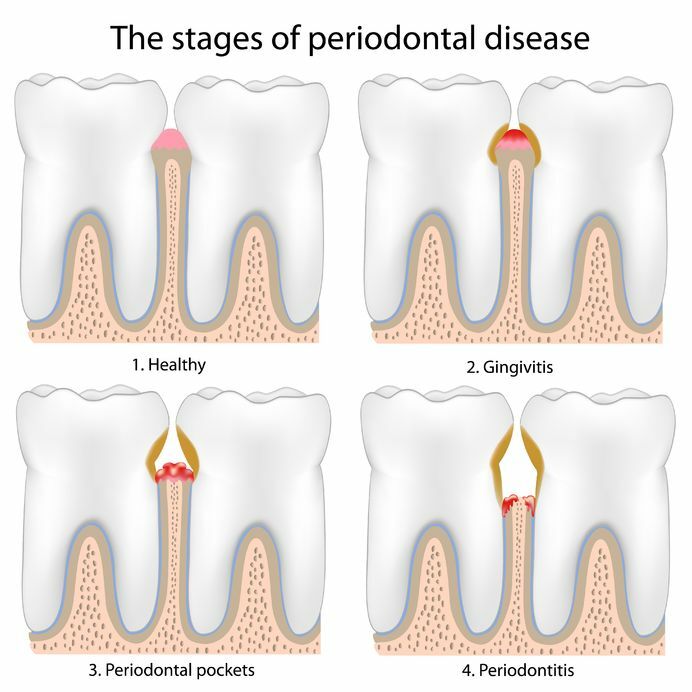 Pocket reduction surgery is one way to treat periodontal disease. Dr. Schilt can remove bacteria and tartar (calculus) from the roots of teeth to eliminate bacteria, reducing inflammation and saving teeth. After a thorough examination and consultation, pocket reduction surgery may be performed under local or general anesthetic depending on the preferences of the patient. Dental bone grafting may be recommended by Dr. Schilt at McKenzie River Dental if your jaw bone has deteriorated due to disease, trauma, or missing teeth. Bone grafting is a surgical procedure that rebuilds the structure of the jaw, restoring both height and width and strengthening the jaw. Crown lengthening is a common surgical procedure to expose more surface area of a tooth by removing gum tissue or bone. Crown lengthening may be necessary if a tooth breaks off at the gum line, if there’s decay underneath a crown or filling, or if there is an abundance of gum tissue already around teeth.